In my previous blog I pointed out that that retailers were not adopting strategies for check in location based marketing. In the blog prior to that I quoted Comstat research that shows that in the first 3 months of this year 16.7 million people check into locations using Foursquare and similar applications, representing 7.1% of the total mobile population. I don’t know what the statistics are for New Zealand, but I suspect the numbers are somewhere between 5 and 7% of the NZ mobile user population. Comstat also came up with some interesting statistics about the demographics of those users. Firstly a lot of people think this is technology for men, that they are the geeks, but of course women love to shop, they are social shoppers and as the graph shows, there are in fact more women than men checking in! The predominant age group should be no surprise, we would expect 18-44 year olds to be the most tech savvy and of course having disposable income for Smartphones which are the predominant mobile used for check ins. Again from Comstat for the first 3 months of this year in the USA Android pipped Apple at 36.6% to 33.7$ of devices used for checking in. 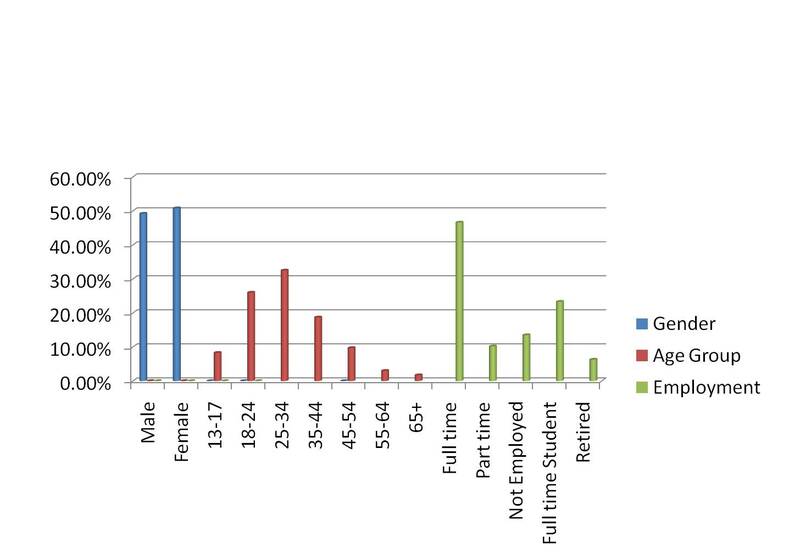 The largest group of users were in full time employment 46.6% and the second largest at 23.3% were full time students. Just as a footnote to my blog on Group Deals and Bricks and Mortar Business there was an interesting story in eMarketer a couple of days ago. The story contained statistics that from research by Cooper Murphy Copywriters in July this year, 82% of Groupon users expressed dissatisfaction with the level of repeat business they generated from their campaigns and 49% would not use them again. This is interesting when many companies use daily deal type promotions to introduce new customers to their stores. Of course you know where I am going with this series and that is that Location or Proximity Based Marketing offers far more compelling tools for retailers and other destination businesses to entice people into their premises. Obviously a fundamental component of that is not just how to get them to come to you, but how to get them there when you want them and to have them purchase or consume products or services that achieve your goals. For a retailer that might be those same products you were quitting on a daily deal, but like the Auckland superette owner who has been selling milk at 10 cents below cost as a loss leader, part of the strategy behind that is the opportunity to merchandise other products those same people will buy with a healthy profit margin. If you have an aged stock problem, location based marketing can get people into your store and while they enjoy the low price of your distressed inventory, put something at eye level in from of them that increases the profit of your sale. Cherry pickers do not make you profit. Likewise if you have a cafe or restaurant, don’t just offer a free coffee with $5 worth of food. Offer it only at times when your business is empty and not to the people who were coming in anyway, they are dealt with using your normal loyalty program. Of course loyalty marketing is also very important and fits into location, but you’re going to have to come back to a future blog for that. Thanks for reading our blog. If you think this is of interest to people you know, please tell them about it or send them a link. You can also subscribe using the RSS feed.